Standard on the California 1400 Touring version, this 35L (70L total) fiberglass sidebag kit can be installed on the Custom to considerably increase the cargo capacity. 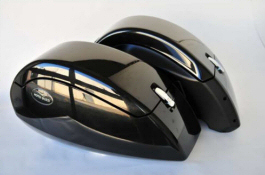 These kit comes with chromed hardware, mounting brackets and complete compatibility with all other OEM Moto Guzzi accessories. Please note: Side Case Support Kit B064286 is INCLUDED with these bags. *Please note: These do not fit the Eldorado 1400. The spanner bracket that goes behind the licence plate does not fit due to interference with the fender, so the bags have no vertical support. Moto Guzzi Adjustable Billet Aluminum Passenger Footrest Kit For California 1400 Touring, California 1400 Custom, Eldorado 1400.